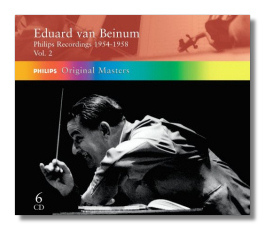 This is the second volume on Decca featuring the fine Dutch conductor Eduard van Beinum. This time, the six CD's on offer feature the recordings made for Philips in the mid to late 50's when he collapsed with a heart attack during rehearsals of Brahms' First Symphony. Van Beinum was always a fine exponent of the baroque repertoire and his recordings of Bach's Four Orchestral Suites are true gems. One lavishes in the exquisite sounds of the 'Badinerie' from Suite #2 or the ethereal beauty in the Air from Suite #3. The Overtures of the 2nd and 4th Suites are also full of pomp and celebration with the Concertgebouw playing with true conviction. Handel's 'Water Music' also makes a welcome appearance here with van Beinum phrasing the music quite magically although I still prefer Fritz Lehmann's magnificent account with the Berlin Philharmonic Orchestra available on a DG Archiv disc. Mozart was also a perennial Van Beinum favourite and this recording of the Flute and Harp Concerto is indeed quite magical with both Herbert Barwahser and Phia Berghout playing with consummate charm. A rare recording of the 'Posthorn' Serenade is also very desirable and compares well with Karl B�hm's classic account with the Berlin Philharmonic Orchestra. Brahms was always a hallmark of the Van Beinum style and this stereo account of the much recorded First Symphony is perhaps his best overall. It includes a thrilling First Movement and a fine Finale that moves along with conviction and momentum. The Haydn Variations are also well shaped although rather earthbound whilst the Alto Rhapsody has the famed Aafje Heynis in fine voice throughout. The next disc includes three Schubert symphonies with the Third particularly effusive and the Sixth also very fine. Finally we are treated to some gorgeous Debussy, one of the highlights of Van Beinum's recorded career. The 'Nocturnes' float ethereally across the seas, whilst 'La Mer' is beautifully expansive especially in the 'Dialogue du vent et de la mer'. Finally there are the 'Images', picture portraits of Iberian landscapes that can be counted as some of the best ever recorded. Although the recordings are occasionally on the dull side, this set is indeed a fine memorial to a tragically short lived conductor in some of his favourite music.